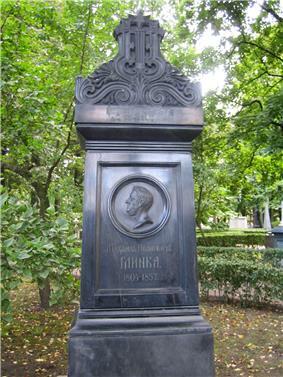 Mikhail Ivanovich Glinka (Russian: Михаи́л Ива́нович Гли́нка; 1 June [O.S. 20 May] 1804 – 15 February [O.S. 3 February] 1857) was the first Russian composer to gain wide recognition within his own country, and is often regarded as the fountainhead of Russian classical music. 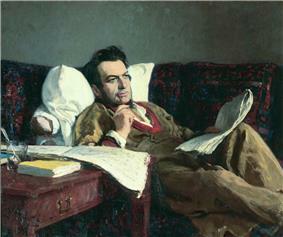 Glinka's compositions were an important influence on future Russian composers, notably the members of The Five, who took Glinka's lead and produced a distinctive Russian style of music. Mikhail Glinka was born in the village of Novospasskoye, not far from the Desna River in the Smolensk Governorate of the Russian Empire (later in the Yelninsky District of the Smolensk Oblast). His wealthy father had retired as an army captain, and the family had a strong tradition of loyalty and service to the tsars, while several members of his extended family had also developed a lively interest in culture. His great-great-grandfather was a Polish–Lithuanian Commonwealth nobleman, Wiktoryn Władysław Glinka of the Trzaska coat of arms. As a small child, Mikhail was reared by his over-protective and pampering paternal grandmother, who fed him sweets, wrapped him in furs, and confined him to her room, which was always to be kept at 25 °C (77 °F); accordingly, he developed a sickly disposition, later in his life retaining the services of numerous physicians, and often falling victim to a number of quacks. The only music he heard in his youthful confinement was the sounds of the village church bells and the folk songs of passing peasant choirs. The church bells were tuned to a dissonant chord and so his ears became used to strident harmony. While his nurse would sometimes sing folksongs, the peasant choirs who sang using the podgolosochnaya technique (an improvised style – literally under the voice – which uses improvised dissonant harmonies below the melody) influenced the way he later felt free to emancipate himself from the smooth progressions of Western harmony. After his grandmother's death, Glinka moved to his maternal uncle's estate some 10 kilometres (6.2 mi) away, and was able to hear his uncle's orchestra, whose repertoire included pieces by Haydn, Mozart and Beethoven. At the age of about ten he heard them play a clarinet quartet by the Finnish composer Bernhard Henrik Crusell. It had a profound effect upon him. "Music is my soul", he wrote many years later, recalling this experience. While his governess taught him Russian, German, French, and geography, he also received instruction on the piano and the violin. 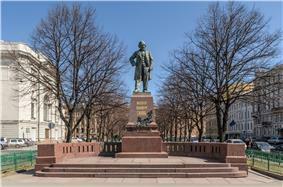 At the age of 13, Glinka went to the capital, Saint Petersburg, to study at a school for children of the nobility. Here he learned Latin, English, and Persian, studied mathematics and zoology, and considerably widened his musical experience. He had three piano lessons from John Field, the Irish composer of nocturnes, who spent some time in Saint Petersburg. He then continued his piano lessons with Charles Mayer and began composing. When he left school his father wanted him to join the Foreign Office, and he was appointed assistant secretary of the Department of Public Highways. The work was light, which allowed Glinka to settle into the life of a musical dilettante, frequenting the drawing rooms and social gatherings of the city. He was already composing a large amount of music, such as melancholy romances which amused the rich amateurs. His songs are among the most interesting part of his output from this period. 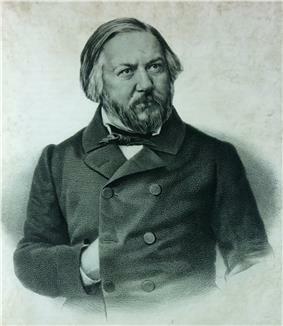 In 1830, at the recommendation of a physician, Glinka decided to travel to Italy with the tenor Nikolai Kuzmich Ivanov. The journey took a leisurely pace, ambling uneventfully through Germany and Switzerland, before they settled in Milan. There, Glinka took lessons at the conservatory with Francesco Basili, although he struggled with counterpoint, which he found irksome. Although he spent his three years in Italy listening to singers of the day, romancing women with his music, and meeting many famous people including Mendelssohn and Berlioz, he became disenchanted with Italy. He realized that his mission in life was to return to Russia, write in a Russian manner, and do for Russian music what Donizetti and Bellini had done for Italian music. His return route took him through the Alps, and he stopped for a while in Vienna, where he heard the music of Franz Liszt. He stayed for another five months in Berlin, during which time he studied composition under the distinguished teacher Siegfried Dehn. A Capriccio on Russian themes for piano duet and an unfinished Symphony on two Russian themes were important products of this period. 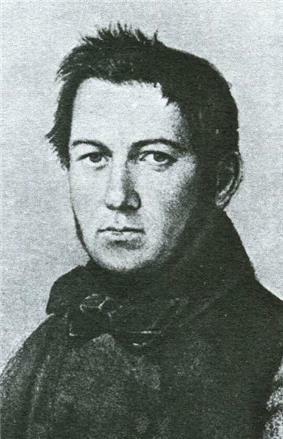 When word reached Glinka of his father's death in 1834, he left Berlin and returned to Novospasskoye. While in Berlin, Glinka had become enamored with a beautiful and talented singer, for whom he composed Six Studies for Contralto. He contrived a plan to return to her, but when his sister's German maid turned up without the necessary paperwork to cross to the border with him, he abandoned his plan as well as his love and turned north for Saint Petersburg. There he reunited with his mother, and made the acquaintance of Maria Petrovna Ivanova. After he courted her for a brief period, the two married. The marriage was short-lived, as Maria was tactless and uninterested in his music. Although his initial fondness for her was said to have inspired the trio in the first act of opera A Life for the Tsar (1836), his naturally sweet disposition coarsened under the constant nagging of his wife and her mother. After separating, she remarried. Glinka moved in with his mother, and later with his sister, Lyudmila Shestakova. A Life for the Tsar was the first of Glinka's two great operas. It was originally entitled Ivan Susanin. Set in 1612, it tells the story of the Russian peasant and patriotic hero Ivan Susanin who sacrifices his life for the Tsar by leading astray a group of marauding Poles who were hunting him. The Tsar himself followed the work's progress with interest and suggested the change in the title. It was a great success at its premiere on 9 December 1836, under the direction of Catterino Cavos, who had written an opera on the same subject in Italy. Although the music is still more Italianate than Russian, Glinka shows superb handling of the recitative which binds the whole work, and the orchestration is masterly, foreshadowing the orchestral writing of later Russian composers. The Tsar rewarded Glinka for his work with a ring valued at 4,000 rubles. (During the Soviet era, the opera was staged under its original title Ivan Susanin). In 1837, Glinka was installed as the instructor of the Imperial Chapel Choir, with a yearly salary of 25,000 rubles, and lodging at the court. In 1838, at the suggestion of the Tsar, he went off to Ukraine to gather new voices for the choir; the 19 new boys he found earned him another 1,500 rubles from the Tsar. He soon embarked on his second opera: Ruslan and Lyudmila. The plot, based on the tale by Alexander Pushkin, was concocted in 15 minutes by Konstantin Bakhturin, a poet who was drunk at the time. Consequently the opera is a dramatic muddle, yet the quality of Glinka's music is higher than in A Life for the Tsar. He uses a descending whole-tone-scale in the famous overture. This is associated with the villainous dwarf Chernomor who has abducted Lyudmila, daughter of the Prince of Kiev. There is much Italianate coloratura, and Act 3 contains several routine ballet numbers, but his great achievement in this opera lies in his use of folk melody which becomes thoroughly infused into the musical argument. Much of the borrowed folk material is oriental in origin. When it was first performed on 9 December 1842, it met with a cool reception, although it subsequently gained popularity. Glinka went through a dejected year after the poor reception of Ruslan and Lyudmila. His spirits rose when he travelled to Paris and Spain. In Spain, Glinka met Don Pedro Fernández, who remained his secretary and companion for the last nine years of his life. In Paris, Hector Berlioz conducted some excerpts from Glinka’s operas and wrote an appreciative article about him. Glinka in turn admired Berlioz’s music and resolved to compose some fantasies pittoresques for orchestra. Another visit to Paris followed in 1852 where he spent two years, living quietly and making frequent visits to the botanical and zoological gardens. From there he moved to Berlin where, after five months, he died suddenly on 15 February 1857, following a cold. He was buried in Berlin but a few months later his body was taken to Saint Petersburg and re-interred in the cemetery of the Alexander Nevsky Monastery. Glinka was the beginning of a new direction in the development of music in Russia. Musical culture arrived in Russia from Europe, and for the first time specifically Russian music began to appear, based on the European music culture, in the operas of the composer Mikhail Glinka. It was the nation and historicism. Different historical events are often used in the music, but for the first time they were shown in a realistic veracity. The first has noted this new musical direction was Alexander Serov. Then he was supported by his friend Vladimir Stasov (they were so long and with such thoroughness solved influence creativity of Glinka, that quarreled forever), who became the theorist of this musical direction. This direction is developed later composers of The Five (composers). The modern Russian music critic Rimsky-Korsakov and Borodin. Soussanine is an opera, where the main character is the people, Ruslan is the mythical, deeply Russian intrigue, and in Guest, the drama dominates over the softness of the beauty of sound." Two of these operas – Ivan Soussanine and Ruslan and Ludmila – were composed by Glinka. Since this time, the Russian culture began to occupy an increasingly prominent place in world culture. In 1884, Mitrofan Belyayev founded the "Glinka Prize", which was awarded annually. In the first years the winners included Alexander Borodin, Mily Balakirev, Pyotr Ilyich Tchaikovsky, Nikolai Rimsky-Korsakov, Cesar Cui and Anatoly Lyadov. Outside Russia several of Glinka's orchestral works have been fairly popular in concerts and recordings. Besides the well-known overtures to the operas (especially the brilliantly energetic overture to Ruslan), his major orchestral works include the symphonic poem Kamarinskaya (1848), based on Russian folk tunes, and two Spanish works, A Night in Madrid (1848, 1851) and Jota Aragonesa (1845). Glinka also composed many art songs, many piano pieces, and some chamber music. A lesser work that received attention in the last decade of the 20th century was Glinka's "The Patriotic Song", supposedly written for a contest for a national anthem in 1833. In 1990, Supreme Soviet of Russia adopted it as the anthem of the Russian Soviet Federative Socialist Republic, which had been the only one of the Soviet republics without its own anthem. Following the dissolution of the Soviet Union, the hymn was confirmed as the Russian national anthem in 1993; it remained until 2000. Soviet astronomer Lyudmila Chernykh named a minor planet 2205 Glinka in his honor. It was discovered in 1973. A crater on Mercury is also named after him. See: List of compositions by Mikhail Glinka. ^ "...regarded by his compatriots as the source and fountainhead of Russian Music," in "Russian Symphony Orchestra", New York Times, 1904-11-13, p. 10. ^ Grove Music Online "Glinka"
^ a b "Александр Серов (Alexander Serov)" (in Russian). Классическая музыка. Retrieved 17 March 2013. ^ ПОСТАНОВЛЕНИЕ ВС РСФСР ОТ 23.11.1990 О ГОСУДАРСТВЕННОМ ГИМНЕ РСФСР [On the National Anthem of the Russian SFSR]. ^ " [Presidential Decree on the National Anthem of the Russian Federation]""УКАЗ ПРЕЗИДЕНТА РФ ОТ 11.12.93 N 2127 "О ГОСУДАРСТВЕННОМ ГИМНЕ РОССИЙСКОЙ ФЕДЕРАЦИИ. President of the Russian Federation (in Русский). lawrussia.ru. 11 December 1993. Retrieved 25 January 2015. ^ Schmadel, Lutz D. (2003). Dictionary of Minor Planet Names (5th ed.). New York: Springer Verlag. p. 179. Cylinder recording of a Glinka composition, from the Cylinder Preservation and Digitization Project at the University of California, Santa Barbara Library.